I've never been to another state's fair, but the people I know who've moved up here from the midwest all agree that the Alaska State Fair is something special. It's an annual tradition for most Alaskan families who, at the end of each August, head toward Palmer for the food, rides, exhibits, and performances. Off-the-gridders who live way out in the backwoods ride their 4-wheelers to the main road and come on in to town. The Russian Old Believers make their way up from the Kenai Peninsula. Alaska Natives fly in from the villages. And the rest of us pile into our cars and drive to the Valley. What is it that makes the State Fair so much fun? I think that part of the appeal is the palpable sense of familiarity and friendship. We're so far away from the rest of the U.S. that we don't have the usual assortment of traveling vendors who move from fair to fair to fair. Our booths are operated by Alaskans who have been here forever and who can be counted on for their consistency, hard work, and appreciation for tradition. You don't have to worry about your BBQ turkey legs or your halibut tacos or your favorite cream puffs; they'll be there and tasting just the way you like 'em year after year after year. Plus, fair days are the time of year when you're bound to run into people you haven't seen in ages. I once was waiting in line when I recognized my old Girl Scout leader standing in front of me. Another time my husband and I walked into an old friend we hadn't seen since college. At the fair, we cross paths with all kinds of family, friends, and acquaintances from our various circles of life. The main reason to go to the fair, however, is the food. Oh, my heavens, the food. I've found it's best not to mention my favorite fair food to others, because like politics or religion, the discussion ends up quite heated. Start insisting pork chops on a stick are the best, and someone will argue No, cheese curds are much better, then someone else will jump in yelling about beef pasties, and before you know it, blows are raining down on your head. Suffice it to say that each person in my family has his or her favorites. My husband goes for the Polish dogs, the Husky cheeseburgers, and the cream puffs. I like the roasted corn on the cob, the gyro sandwiches, and the cream puffs. My girls like the corn dogs, the cotton candy, and . . . the cream puffs. 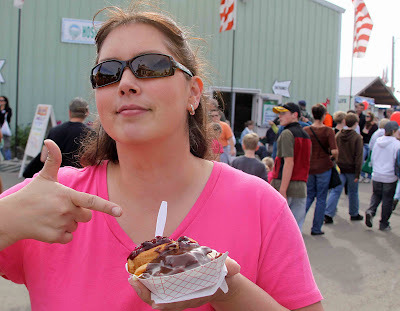 Eating one's way across the fairgrounds is most important, but there are many other reasons to attend the Alaska State Fair. So I'm dedicating the next couple of days on my blog to rides, crazy hair, and 90-pound cabbages. Prepare yourself. I don't know if I've ever had a cream puff that looks like that. I'm going to have to try one...you know, for research purposes! Pennsylvania doesn't have a state fair as far as I know, but we do have a myriad of regional ones. The Bloomsburg Fair is the closest to us, and it starts in 3 weeks! My favorite treat there is the frozen cheesecake on a stick. I don't think I've ever had a cream puff...I don't even know if they serve them at our State Fair (don't hate me!!). But at our State Fair, they have the best roasted corn!!! YUM! And of course we always have to get cotton candy!! "cheese curds are much better"
Which sums it all up.